Dot & Lil (& Anne!) wish you happy holidays! Hope to see you one last time this year, at the Rusty Plum Holiday Market, Saturday December 19th 11 am - 7 pm & Sunday December 20th 11 am-5 pm at 105 St-Viateur O., corner St-Urbain. Also, any orders over $60 can be delivered on the island of Montreal anytime before December 24th and starting again on the 27th, so all you last minute gift givers be thankful! Email me at dotandlil@gmail.com for our product list. 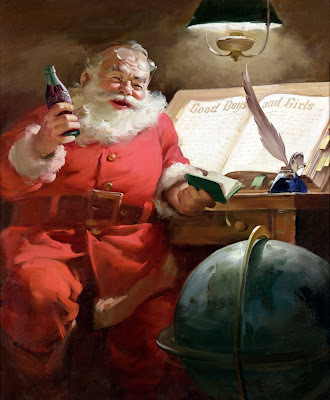 Personally, I'm sitting here wondering how to get some Dot & Lil soap into santa's hands, like in the image above. Now that, is product placement!